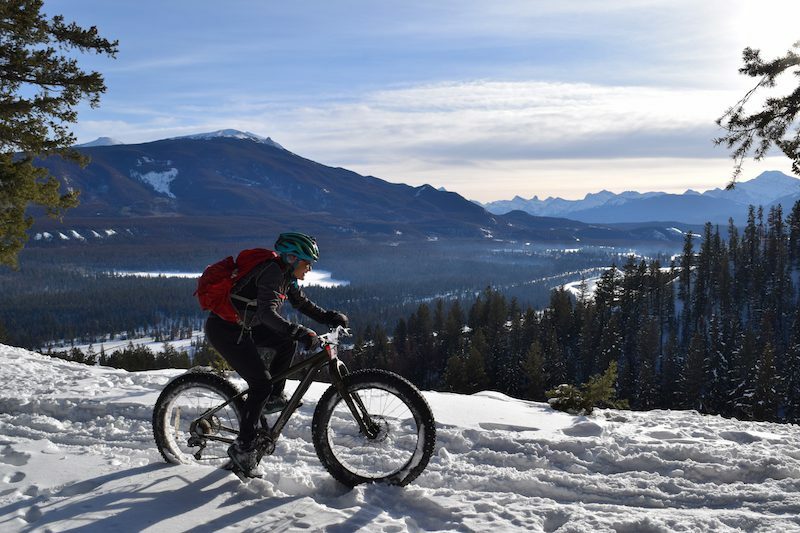 Unseasonably warm weather greeted racers showing up for Frosty’s Fat Bike Race series stop in Jasper, Alta, this year. With the warm weather replacing deep-freeze temperatures of years past, the new challenge for racer became managing soft snow conditions. Maaranen’s zen-like approach to the tough conditions certainly helped. After a steady start, knowing the day could be longer than riders were expecting, the Bend, Ore. rider worked her way through the field to claim the $1,500 prize purse, equal for men and women. Sarah Robbins followed in second, with Erin Woodrow in third. Not everyone was having as easy a time with the snow. A five km section of variable, but mostly soft, snow had racers off and walking as much as they rode their bike as they hunted for traction. Despite the addition of more “type two fun” than many were expecting, fantastic views and clear blue skies helped revive flagging spirits until the course returned to firmer ground. On the men’s side, tight, three-way battle played out. Edmonton’s Mitchell Thomas and Provo, Utah’s Geoff Montegue took very different strategies in the race. Montegue chose to dump pressure down to just a hair above 1 PSI to deal with the soft conditions. Thomas opted for better rolling speed on the faster sections, even if it meant struggling through the soft parts. Close behind, Matt Staneland was chasing hard on his rented Kona, keeping both riders honest. Using the lower pressure to his advantage, Montegue built up nearly a one minute advantage through the middle, slower section of course. With a long descent to the finish, though, it was Thomas’ strategy that ended up paying off. He rolled back to, and past the Utah rider to take the win, and $1,500 prize in the men’s race. Montegue held on for second, with Staneland finishing third. So what was the trick to surviving Jasper’s energy sapping soft snow? Whether you were at the front or just looking to make it to the finish, there was a common theme. A mix of strategy, decision-making, and attitude was the best way to make it through the day. Which brings us to attitude. “I flipped right over a bank,” Sheldon says, both laughing, “I knew I was going, so I unclipped and jumped and just picked a spot to land. I looked back up, and my bike was just sitting there at the top.” “Like it was just waiting for you,” Eric adds.